Chris LeDoux (October 2, 1948 – March 9, 2005) was an American country music singer-songwriter, bronze sculptor, and hall of fame rodeo champion. 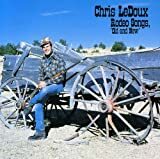 During his career LeDoux recorded 36 albums (many self-released) which have sold more than six million units in the United States as of January 2007. He was awarded two gold and one platinum album certifications from the Recording Industry Association of America (RIAA), was nominated for a Grammy Award, and was honored with the Academy of Country Music Music Cliffie Stone Pioneer Award. LeDoux is also the only person to ever both participate and perform at the Houston LiveStock Show & Rodeo. Rodeo Songs, "Old and New"